Need more information about booking Home 9687589 ? The Garden Apartment is one of the most popular apartments at Casa Beachcomber. It is located less than a minute’s walk from the shared swimming pool and benefits from three private terraces/verandas which capture the sun of the day. As its name implies, this apartment looks directly on to the garden and the old bowling green. From the front terrace one enters the apartment through the kitchen lobby, lounge opens directly onto a veranda under a vine trellis, a perfect place to chill out and watch the sunset. The kitchen has an arched serving hatch opening into the lounge allowing parents to keep an eye on their children while preparing food. Garden apartment has two bedrooms. Bedroom one has a double bed, a walk-in wardrobe and dressing room. Bedroom two has two single beds and a set of French doors which open directly onto the third veranda. Garden apartment is a great choice for families and small group friends to prefer private outdoor spaces. This Apartment has 2 bedrooms, 1 bathroom and sleeps 2. It’s been listed on Holiday Lettings since 13 Sep 2018. 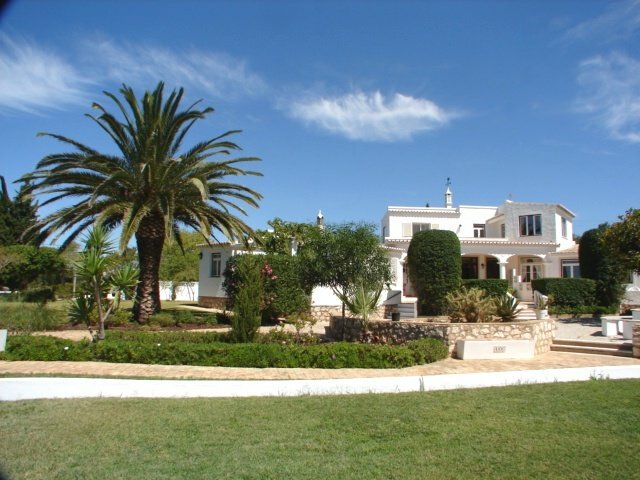 Located in Faro District, the average weekly rate varies from £542 to £975. You can get in touch with Martine (the owner) through the contact form on this page. Send Martine (the owner) an email through the contact form on this page. Alternatively, if there’s a phone number on this page, you can call them. How do I contact Martine (the owner)? If you’ve already booked, go to Manage your holiday booking to view Martine the owner's contact details or send them a message. Or send Martine (the owner) an enquiry through the Contact the owner/manager form if you’d like a quote or more info first. When you pay online through the Book your stay form, a booking request is sent to Martine (the owner). You’ll find out within 24 hours whether they’ve accepted - no money will leave your account before then. You can also request a quote from Martine (the owner) through the contact form. The owner will email you the total cost for your dates and a link to book and pay online. Use the Book your stay form to pay provisionally online. You can pay by credit/debit card or PayPal. Martine (the owner) will have 24 hours to accept the booking and no money will leave your account before then. Why can't I call Martine (the owner) before booking? You’ll need to contact Martine (the owner) to do this. Send them a message in Manage your holiday booking or through the contact form on this page. You can request to change the dates or number of people on your booking via the Manage your holiday booking page. To change your holiday dates use the Edit booking button. If you need to change the number of guests staying then send Martine (the owner) a message. If Martine (the owner) agrees, they’ll send you a revised quote outlining the changes. You can review and accept/decline this from the Manage your holiday booking page. You’ll have 48 hours to take action before the revised quote expires.